The larynx is located at the superior margin of the trachea and below the hyoid bone, which is located at the base of the tongue. The larynx is at the level of the fourth to sixth cervical vertebrae. The larynx functions as a guard against the entrance of solids and liquids into the trachea, as well as being the organ of voice production. The epiglottis is attached above the larynx. The function of the epiglottis is generally believed to be protection of the airway during swallowing. The body of the larynx consists of a series of cartilaginous structures: the thyroid, the cricoid, and the arytenoid cartilages. The thyroid cartilage forms the bulk of the structure of the larynx and produces the prominence in the neck known as the Adam's apple. 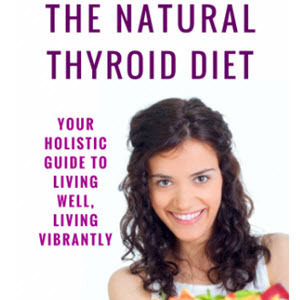 Toward the top of the thyroid cartilage is the thyroid notch. 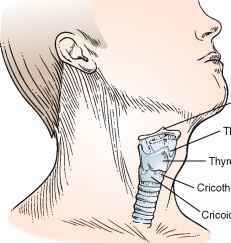 Farther down on the thyroid cartilage, there is a space, the cricothyroid space and membrane, that separates the thyroid cartilage from the cricoid cartilage. The cricoid cartilage articulates with the cricothyroid membrane superiorly and the trachea inferiorly. It is the only complete ring of cartilage in the larynx. The paired arytenoid cartilages provide an important area for attachment of the vocal cords. A diagram of the thyroid and cri-coid cartilages onto the neck is illustrated in Figure 12-8, and the laryngeal skeleton is illustrated in Figure 12-9. The vocal cords vibrate to generate speech. 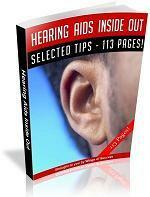 Sound is produced by the rapid vibration of the vocal cords excited by the exhaled stream of air. The vocal cords are brought together, and their tension is changed, by the action of various laryngeal muscles. The nerve supply to the larynx is derived from the superior and recurrent laryngeal branches of the vagus, or 10th cranial, nerve. Voice produced at the larynx is modified by the pharynx and oronasal cavity.